Buckhurst Park in East Sussex is one of the oldest estates in Britain, owned by the Sackville family and their predecessors. The current head of the family, Lord De La Warr, has always had a keen interest in food and its production. As a boy, her was immensely fond of a particular local sausage, produced by a butcher in neighbouring Royal Tunbridge Wells. Some thirty years later, lamenting the disappearance of that old childhood favourite, he embarked on a quest to rediscover that traditional, regional, flavour. He eventually managed to track down the family of the original butcher, who were happy to pass on their father’s ingredients. We’ve taken those and, guided by Lord De La Warr, rebalanced them to create this sausage. 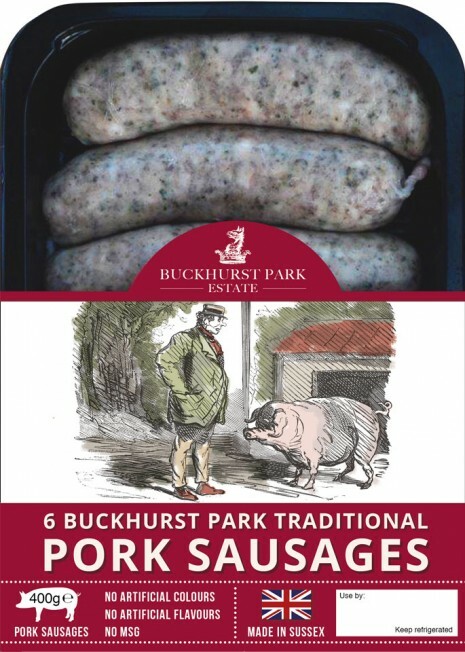 We’re proud to share this tribute to a long-forgotten taste and to have the Buckhurst Park name on the label. Pork Cuts (80% – Pork Shoulder 46.5%, Pork Belly 33.5%), water, rusk (wheat flour (gluten), salt, spices, herbs, Preservative E223 (sulphite), anti-oxidant E301, Filled into Natural Pork casing.